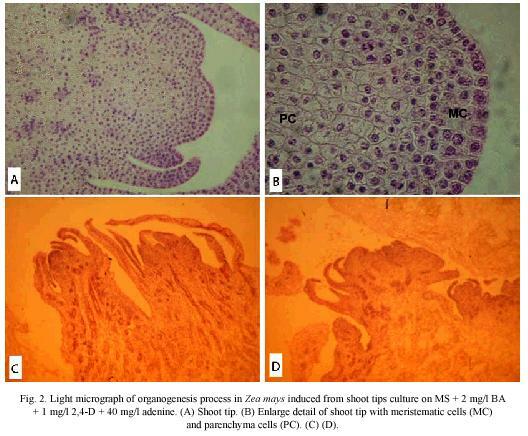 Abstract: Shoot tips of maize (Zea mays L.) were cultured on Murashige and Skoog medium supplemented with 2 mg/l BA +1 mg/l 2,4-D +40 mg/l, to investigate phases of ontogenetic development. The study used light microscopy as well as scanning and transmission electronic microscopy techniques. Shoot tips of maize are composed of small cells with a dense cytoplasm and a prominent nucleus. The process of organogenesis began with swelling of the shoot tip, as the first evidence of organogenic calli formation observed three weeks after culture get started. There were two morphologically different types of cells within the organogenic calli. The layer consisted of large cells with small nucleus, free-organelle cytosol, irregular plasmatic membrane, trichome-like structures, and thick cell walls. In the inner cell layer, small and isodiametric cells with a prominent nucleus, small vacuoles, endoplasmatic reticulum, Golgi, mitochondrias and chloroplasts were observed. The presence of trichomes in the more active morphogenic zones could indicate an organogenic potential. Rev. Biol. Trop. 57 (Suppl. 1): 129-139. Epub 2009 November 30. Key words: in vitro culture, histology, ultrastructure, shoot organogenesis, Zea mays, Costa Rica. Maize (Zea mays) is an important crop and one of the main cereals for human consumption in Central America, Mexico, Asia and Africa (OConnor-Sanchéz et al. 2002, Valdez et al. 2004). However, crop productivity in tropical zones is often low due to abiotic and biotic stresses (Valdez et al. 2004). Therefore, there is considerable interest in the development of new maize cultivars tolerant to diseases, pests and drought (OConnor-Sanchéz et al. 2002). Plant biotechnology represents an alternative to the maize conventional breeding programs; nevertheless, improvement through genetic diploid engineering or mutagenesis requires a reliable and efficient in vitro culture system. The totipotent character of plant cells and tissues is expressed by their ability to regener ate into plants by organogenesis or somatic embryogenesis (Fortes & Pais 2000). In the first case, organogenesis is the developmental pathway by which shoots and roots are formed in response to culture (concentration and type of plant growth regulators), and environmen tal (light intensity, temperature and photope riod) conditions. On the other hand, somatic embryogenesis is the developmental process by which bipolar structures that resemble zygotic embryos are developed from haploid or somatic cells through an orderly embryologi cal stage without gamete fusion. In contrast to somatic embryogenesis pathway, organogenesis is characterized by the presence of vascular connections between mother tissue and the regenerating sections (Jiménez 2001, 2005). However, genetic engineering or mutagenesis techniques cannot be successfully achieved if the processes leading to morphogenesis are not well understood (Fortes & Pais 2000). Histological, biochemical and ultrastructural aspects of somatic embryogenesis and organogenesis have been extensively reported in several species (Boissot et al. 1990, Arrieta et al. 1995, Vega 1999, Fortes & Pais 2000, Quiroz-Figueroa et al. 2002, Lara et al. 2003, Gatica et al. 2007). In maize, to date the most reproducible regeneration system has been obtained from embryogenic type II calli induced from inmature embryos from a reduced number of genotypes such as the non-commercial A-188 line (Rhodes et al. 1988, Fromm et al. 1990, Gordon-Kamm et al. 1990, OConnor-Sanchéz et al. 2002). Based on these experiences, most efforts have been oriented to achieve maize plant regeneration through in vitro organogenesis using temperate (Zhing et al. 1992), tropical and subtropical genotypes (OConnor-Sánchez et al. 2002). In spite of the great number of investigations in numerous maize cultivars and varieties for in vitro plant regeneration via organogenesis, few of them present sufficient histological evidence to understand the process. In this sense, studies regarding developmental stages of organogenesis are needed in order to understand the developmental pattern of in vitro morphogenesis. Therefore, the aim of this work was to describe the events leading to the development of plantlets from organogenic callus obtained from Costa Rican maize "Diamantes 8843" through histological analysis. This work may lead to a better understanding of in vitro development and consequently result in higher regeneration rates that should benefit clonal propagation and genetic improvement. Induction of morphogenetic calli and plant regeneration: Diamantes 8843 mature seeds were disinfected according to O`Connor et al. (2002) and were germinated on MS basal medium (Murashige & Skoog 1962) without growth regulators. After seven days of culture, shoot tips were excised and subcultured on MPC medium (MS +2 mg/l BA +1 mg/l 2,4-D +40 mg/l adenine) (O`Connor et al. 2002). Four weeks later, calli arising from the explant were isolated and subcultured on MPC. For plant regeneration, calli were cultured on MS basal medium without growth regulators. All cultures were maintained with a 16 h photoperiod (3µmol/m2s), at 27ºC. Photographs of different stages of the organogenic process were taken using a stereomicroscope with an attached digital camera. Light microscopy: Shoot tips, 6-weeksold organogenic calli and in vitro regenerated shoots were fixed in 2% glutaraldehyde and 2% paraformaldehyde in 0.1 M sodium phosphate buffer with pH 7.4 for 12 h at 4ºC (Karnovsky 1965). The samples were dehydrated in an ethanol series and embedded in paraffin. Sections of 30 µm were fixed on glass slides and stained with hematoxylin, safranin, or fast green. The specimens were observed with a light microscope. mounted specimens were coated with a very thin layer of gold-palladium and subsequently examined in a scanning electron microscope (S-570, Hitachi) at an accelerating voltage of 15 KV (Goodhew et al. 2001). Transmission electron microscopy (TEM): Pieces of 6-weeks-old organogenic calli and in vitro regenerated shoots were fixed in 2% glutaraldehyde and 2% paraformaldehyde in 0.1 M sodium phosphate buffer pH 7.4 for 12 h at 4ºC. After repeated washing in sodium phosphate buffer pH 7.4, the samples were postfixed in 1% osmium tetroxide solution for 2 h. Fixed tissues were washed five times, 15 min each, with distilled water and dehydrated in a graded ethanol series (30%-100%) and embedded in Spurr`s resin. For polymerization, samples were kept at 70ºC for 72 h. Sections 70 nm in thickness were obtained using a Reichert- Ultracut microtome and were stained with uranyl acetate and lead hydroxide. The samples were observed with a transmission electron microscope (H-7100, Hitachi), at an accelerating voltage of 100 KV (McIntosh 2007). General morphology: The first evidence of maize organogenic process was the swollen of shoot tips (Fig. 1A) cultured on MPC medium (Fig. 1B). Moreover, this process was characterized by the abundant presence of trichomes (Fig. 1C-1D). The organogenic calli was induced after three weeks of culture (Fig. 1E). Figure 1F shows an in vitro shoot derived from organogenic calli. Light microscopy: The histological observations, at two weeks of culture, revealed an extended cauline structure with an extensive internode arising from the node of the oldest leaves. These leaves are large and have a thick base towards their abaxial face, with a clearly defined spongy and palisade mesophyll towards the base of the leaf. The shoot meristems consisted of numerous small cells in active cellular division; in addition, the leaves primordia showed a defined protodermis covering a compact mass of small meristematic cells, which will give origin to the internal tissues of the leaf (Fig. 2A). The cauline structure showed numerous procambium bands which sets vascular connections of the growing organs. The cauline prolongation elevates the stem with numerous young leaves or foliar primordia around the shoot meristem. In this zone it is observed a compact cellular arrangement, and heavy staining indicates great metabolic activity (Fig. 2B). At the third week of culture, near the base of the oldest leaves, a clear difference between cellular type and size were observed, as well as the formation of cavities due to the lisogenic action of a group of cells (Fig. 2C). 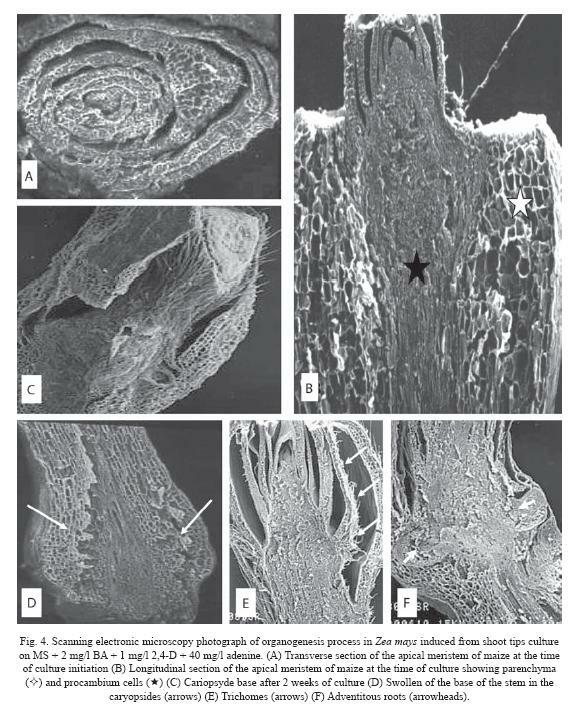 A differentiation of the procambium bands into vascular tissues, xylem and phloem was noticed. Moreover, it was observed the development of the organogenic calli from the peripherial cells of the stem, which showed small stained nuclei. Also, numerous procambium strands were observed very near to the external layer (Fig. 2D). 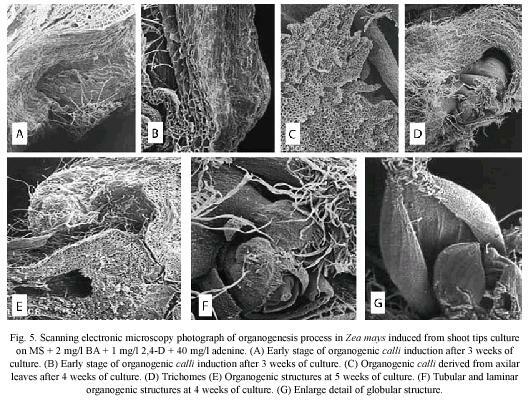 Scanning electron microscopy: SEM observations showed that external surface of organogenic calli is irregular (Fig. 3A), covered by abundant trichomes (Fig. 3B) and had several protuberances (Fig. 3C and 3D). At the time of culture initiation (week 0), a transverse section of maize apical meristem revealed that the oldest leaves surround the youngest leaves in an involving manner with the meristem in the center of the structure (Fig. 4A). Longitudinal section of apical meristem showed two different types of cells, a cortex parenchyma in the outer cell layer, and several procambial strands in the central zone. The cortex consisted of large cells and the procambial strands of elongated and small cells (Fig. 4B). After three weeks of culture, an increment in pubescence was noticed (Fig. 4C), and swelling at the stem base (Fig. 4D) was observed. At this culture stage, it is clear the cellular differentiation of the leaf protodermis, since trichomes formation was observed (Fig. 4E and 5D) and adventitious roots at the base of the oldest leaves of the apical meristem (Fig. 4F). The third week, after culture initiation, seems to be critical in the development of morphogenetic events that lead to the formation of organogenic calli. The Fig. 5A and 5B show the first evidence of the organogenic calli growth in the swollen zone at the base of the maize shoot tips. This calli is composed of large parenchyma cell, which showed cavities and trichomes (Figs. 5C and 5D) Organogenic tubular and laminar structures originated from these cavities. These structures showed involving leaves, as observed in the apical meristem and a cauline base and one or two leaves with compact tissues and abundant pubescence in the outer layer (Fig. 5F). Nevertheless, it was not possible to observe meristematic structures between the leaves suggesting a direct organogenesis regeneration (Fig. 5E). At the fourth week of culture, the organogenic calli showed globular and shoot-type structures on its surface. This structures have parallel veins which are characteristic of leaves of maize plants (Fig. 5G). 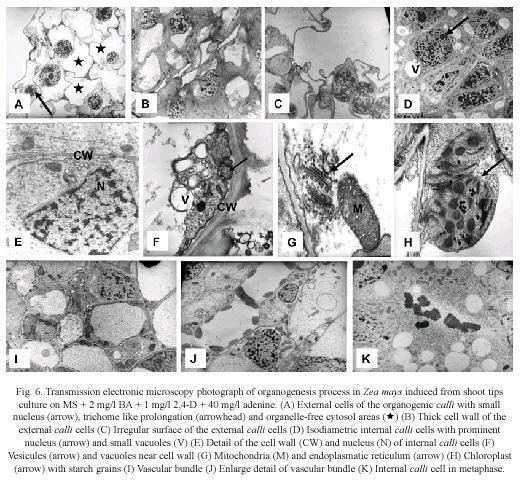 Transmission electron microscopy (TEM): Histological observations on organogenic calli revealed two types of cells. The outer cell layer consisted of large cells with small nucleus, free-organelle cytosol, irregular plasmatic membrane, trichome type prolongations (Fig. 6A), and thick cell walls (Fig. 6B). In some cases, the nucleus occupied the major part of the cell, which did not show proliferating activity (Fig. 6C). In contrast, in the inner cell layer, small and isodiametric cells with a prominent nucleus surrounded by many organelles (Fig. 6D) were observed. At the ultrastructural level these cells are characterized by the presence of small vacuoles with adjacent vesicles (Fig. 6E and 6F), which indicated intensive vesicle-mediated transport. The internal calli cells also showed endoplasmatic reticulum, Golgi, mitochondrias with well-developed cristae (Fig. 6G), chloroplast with thylakoid membranes and internal starch grains (Fig. 6H). There are also signs of xylem and phloem development in its early stages (Fig. 6I and 6J). Fig. 6K shows internal calli cells in metaphase indicating mitotic activity. These observations denote an active metabolism and indicate that internal calli cells resembled meristematic cells. 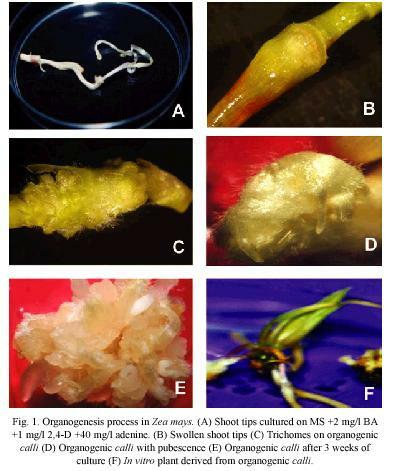 The present study describes the organogenesis process from shoot tips of maize (Zea mays L.) culture on MS +2 mg/l BA +1 mg/l 2,4-D +40 mg/l adenine. In our experiments, TEM observations revealed two distinguishable groups of cells within the calli: competent organogenic cells and non-organogenic cells. The former cells resemble meristematic or embryogenic cells. Studies using light and electron microscopy in many plant species have provided detailed descriptions of the pluripotent cells within the shoot and root meristems. These cells are isodiametric and small with a dense cytoplasm, spherical shaped nucleus and prominent nucleolus and with a higher metabolic activity (Verdeil et al. 2007). Moreover, these competent organogenic cells are highly vacuolated, similar to those described by Apezzato-Da-Gloria & Machado (2004) during organogenesis in Bauhinia forficate and Glycine max. The presence of vacuoles in the internal cells of the calli could be related to an intense activity of cell transport and could be associated with the vesicle formation, indicating an active metabolism and production of cell wall material as observed in B. forficate and G. max (Apezzato-Da-Gloria & Machado 2004). In contrast, the non-organogenic cells were large cells with small nucleus, agreeing with the observations of Popielarska et al. (2006), who described kiwi fruit nonmorphogenic cells as elongated and highly dissociated. Moreover, our TEM observations showed that organogenic competent cells have abundant endoplasmatic reticulum and mitochondria (Fig. 6G), which suggest high rates of protein synthesis and celullar respiration in response to rapid cellular growth, as reported in B. forficate and G. max (Apezzato-Da-Gloria & Machado 2004). All these events are essential for the cell division in the organogenic calli for shoot and root formation. In general, these characteristics have also been described in embryogenic process of maize and are associated with high metabolic activity (Fransz & Schel 1991a, b). The chloroplast containing starch grains observed in maize organogenic competent cells indicate the high nutritional requirement of cell populations during the process (ApezzatoDa-Gloria & Machado 2004). This feature has been related to the acquisition of embryogenic potencial, as embryogenic cells contain starch grains. In this sense, Apezzato-Da-Gloria & Machado (2004) suggested that this characteristic also could be associated to the acquisition of organogenic potential, as starch grains in the chloroplast of meristemoidal cells seems to be a common feature of organogenesis. The grains may reveal a high synthesis capacity associated with the reorganization of growth pattern during somatic morphogenesis (Villalobos et al. 1985, Pihakashi-Maunsbach et al. 1993, Ovecka et al. 2000). The development of the vascular bundles is essential to guarantee the transport between tissues and distant organs, assuring the growth and maintenance of the callus. In this sense, the differentiation of xylem and phloem is critical for the formation of organogenic structures. The use of specific markers in order to distinguish embryogenic competent cells and non competent cells have been suggest (Quiroz-Figueroa et al. 2006). Morphological and cellular differences that indicate acquisition of embryogenic competence are useful as structural markers. In these sense, ultrastructural characteristics have been related to embryogenic potential (Apezzato-Da-Gloria & Machado 2004). In a similar manner, structural markers can be used to identify organogenic competent cells, which can help to improve current maize tissue culture procedures. 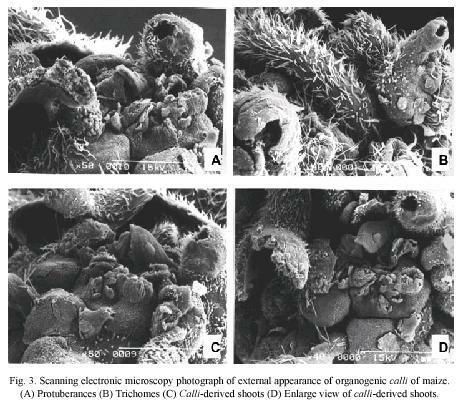 In this study, the abundant presence of trichomes, which originated from the protodermis, in the more active morphogenic zones, could indicate the acquisition of organogenic competence. The organogenic process in rice and bean, seems to show a similar pattern as the one described in this study (Valdez, pers. com.). This work, improves our knowledge of the organogenesis process in maize from shoot tips at the histological and ultrastructural level. This information will contribute to a more accurately determination of the optimal anatomical stages for a stable integration of foreign genes, and the suitable conditions for in vitro culture for the regeneration of transgenic plants. The authors are grateful to Paul Hanson and Helena Umaña for the heplful discussion and critical reading of the manuscript. We thank María Elena Aguilar and Nelly Vázquez from the Centro Agrónomico Tropical de Investigación y Enseñanza (CATIE, Turrialba, Costa Rica) for their technical assistance. This research was supported by the Consejo Nacional para Investigaciones Científicas y Tecnológicas (CONICIT) and the Universidad de Costa Rica (UCR). Los ápices de vástagos de maíz (Zea mays L.) fueron cultivados con el medio Murashige y Skoog, utilizando como suplemento 2 mg/l BA +1 mg/l 2,4-D +40 mg/l, con el fin de investigar el proceso organogénico durante las diferentes fases del desarrollo ontogenético. El estudio utilizó tanto microscopía de luz, como técnicas de microscopía electrónica. Los análisis histológicos revelaron que los vástagos de maíz están compuestos de pequeñas células con citoplasma denso y núcleo prominente. El proceso de organogénesis inicia con el engrosamiento del ápice del vástago, como primera evidencia de la formación organogénica del calli observada tres semanas después del inicio del cultivo. El estudio ultraestructural muestra dos tipos de células morfológicamente diferentes en el calli organogénico. La capa externa consiste de células grandes con núcleo pequeño, citosol sin organelas, membrana plamática irregular, estructuras similares a tricomas y paredes celulares delgadas. Mientras que en la capa interna se observaron células pequeñas e isodiamétricas con un núcleo prominente, vacuolas pequeñas, retículo endoplasmático, Golgi, mitocondrias y cloroplastos. Observaciones de microscopía electrónica revelan la organización externa de la organogénesis del calli del maíz. Los resultados obtenidos en el presente estudio contribuyen con la comprensión del proceso de organogénesis en los ápices de los vástagos del maíz. Este estudio mejorará nuestro conocimiento acerca de los estados anatómicos óptimos para la integración estable de genes externos. Además, provee información de las condiciones apropiadas en el cultivo in vitro para la regeneración de plantas transgénicas. Este estudio sugiere que la presencia de tricomas en las zonas morfogénicas más activas podría indicar su potencial organogénico. Palabras clave: cultivo in vitro, histología, ultraestructura, organogénesis de vástago, Zea mays, Costa Rica. Received 15-XI-2007. Corrected 06-VII-2009. Accepted 02-XI-2009.